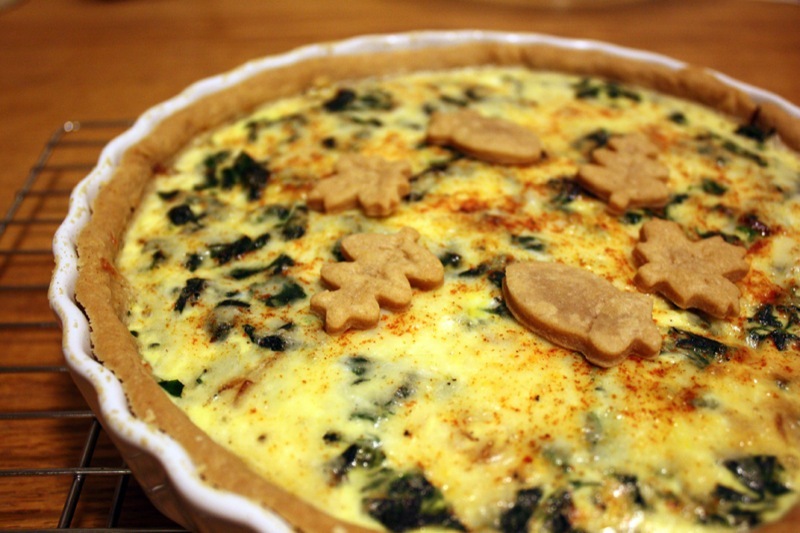 I’d never made a quiche before this. My mom used to make them every so often and I wasn’t too fond of them. The egg, bacon, and onion combination didn’t sit right with me. This one is completely different. Sweet caramelized onions, sharp Gruyère, vibrant green flecks of wilted spinach. Together they are absolutely marvelous. This is based on a recipe from Simply Recipes. I lightened it up a bit and tried to make it a little healthier. To start, the crust is made with white whole wheat flour. I had half and half leftover from the parsnip soup so I used that instead of heavy cream, replaced one of the eggs with 2 egg whites, and cut the amount of cheese by about half. I also threw in about half a bag of spinach. In a food processor, combine flour, salt, and sugar, pulse to mix. Add butter and pulse 6 to 8 times, until mixture resembles coarse meal, with pea size pieces of butter. Add water 1 tablespoon at a time, pulsing until mixture just begins to clump together. If you pinch some of the crumbly dough and it holds together, it's ready, if not, add a little more water and pulse again. Remove dough from machine and place on a clean surface. Carefully shape into a disc. Wrap in plastic wrap and refrigerate for at least an hour. Heat the olive oil in a large saute pan over medium heat. Add onions, season with salt, and cook on medium low, stirring occasionally, for about 40-50 minutes. Add balsamic vinegar and cook about 5-10 minutes longer. Remove onions from pan and set aside (I put them on paper towels to blot off the excess oil). Rinse spinach leaves and add to the pan. Cover and steam until wilted. Remove from pan and squeeze out excess moisture. When cooled enough to handle, transfer to a cutting board and roughly chop. On a lightly floured surface, roll dough into a 12-inch circle. Fit into a 9-by-1 1/2-inch round tart pan, pressing dough into corners. Line with foil and fill with dried beans or pastry weights. Bake for 15 minutes, then remove foil and weights. Poke the bottom of the pastry with a fork and bake about 10 minutes more. Remove to a cooling rack. Whisk together the eggs, egg whites, milk, half and half, salt, pepper, and nutmeg. Sprinkle half of the cheese evenly over the pastry. Top with the onions and spinach then sprinkle with the remaining cheese. Slowly pour the egg mixture on top. Sprinkle lightly with paprika, then bake for about 30-35 minutes, until set. Remove from oven and allow to cool for about 10 minutes before serving. I used this recipe, only with store-bought pie crusts because I ran out of time to make pastry dough. It still came out delicious. The addition of nutmeg was new to me, but I will be using it again! Thanks!